Honda has unveiled an electric dirt bike at the Tokyo Motorcycle Show, dubbed the CR-E.
At this point, the battery bike is just a concept, with no official notice of production plans or availability. However, it does seem this is a long-term project with plans for the market. 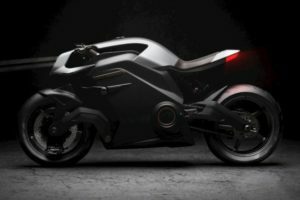 It’s very similar to a machine built by Honda’s affiliate Mugen, often seen as Honda’s skunk works partner for electric two-wheelers. This CR-E prototype seems to run a lot of the same components as the earlier Mugen machine. It’s the same motor, the same suspension, the same aluminum twin-spar frame. Honda isn’t dropping details on specs, at least not yet. We’re still in the dark about horsepower, weight, suspension capability and geometry, and most importantly, battery range. Should the machine be confirmed for production, we presume we’d get those numbers pretty quickly, but remember that a concept is no guarantee of production or availability in specific markets. We’re still waiting for a production version of the Yamaha PED2, (and the TY-E trials bike doesn’t count), and that debuted at the Tokyo Motorcycle Show all the way back in 2015. Still, this is good news for off-roading. KTM’s the only major manufacturer in the electric offroad bike space, with Alta shutting down last summer (BRP bought up some of its assets, but otherwise, it seems Alta isn’t coming back). There’s an important place for electric bikes in the dirt bike world, especially as noise complaints are one of the biggest reasons tracks get shut down. With easy maintenance and instant torque, what’s not to like?